Demonstrating ROI on an internal corporate event can seem like a daunting task. Especially when compared to public events, where the attendee base is likely made up of prospects and customers and where success can be tracked through products sold. And while it’s true you can’t always measure internal conferences in hard dollars, there are many other important success metrics to identify. The overarching goal of most internal events is to increase employee engagement and to provide training that improves efficiency and promotes growth. It’s an integral part of the event management process. Sound about right? Well, you get started by setting goals around these performance indicators. Also, take extra care if your event costs to attend, like some franchise conventions for example. Be sure to survey attendees beforehand to learn why they view the opportunity as being worth their personal investment, and what return they are expecting. When it comes to keeping internal stakeholders happy, this is invaluable intel. 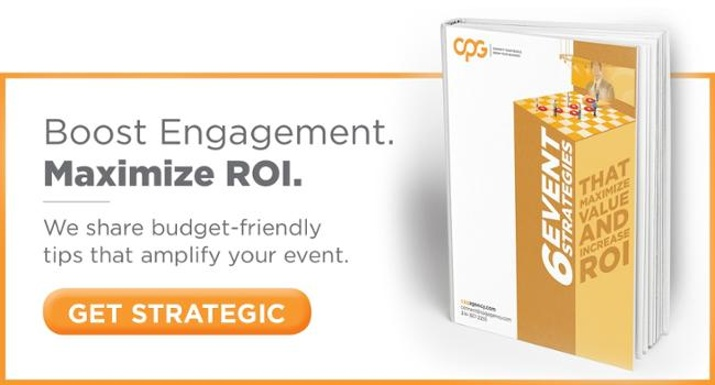 Not all internal events have the ability to leverage the help of sponsors, but adding them into the mix can cut costs that make a big difference in overall ROI. If your event is able to incorporate sponsors, one of the best ways to do so is through an exhibits floors and product demos. As you can see with ULTA, the key is recruiting sponsors whose products and services are directly relevant and helpful to your people’s needs. Doing so demonstrates immediate value to your people as they learn about practical solutions to their problems, and their interest is a success for sponsors. Welcome to Event Success 101: On-Site Engagement. You will never be able to get a full picture of your attendee’s on-site experience without measuring it in real time. Issue live polls to gauge the success of different event aspects like keynote speaker interest, breakout content, exhibit/demo success, and of course, fun. Live polls will deliver the most impact when they’re easily accessible within an event app or another digital platform, and when they’re announced in a controlled environment that sets aside time for everyone to participate. Another great indicator of participation and engagement is user-generated content. People like to see their name and ideas on a screen, so include a twitter wall or other way to share interactions live. And in return, you get a first-hand look into their experience. Superb production quality is a very, very important event success factor. Don’t let production hiccups cause you to go over budget, and damage your chances of achieving positive ROI results. AKA- plan ahead. Plan even farther ahead. Sweat the details. Think through every scenario. Surround yourself with a team who really knows their stuff, and can avoid any potential pitfalls. You get the picture. There are several ways to measure internal satisfaction, but the most direct way is, you guessed it, a survey. Allow your people to give anonymous, open feedback on their event experience, and how it affected overall engagement in and understanding of their role. Though this may take longer to manifest and therefore measure, a byproduct of an engaged workforce is low turnover. If you begin to see an uptrend in retention after your event, you can be sure it made an impact. Increased customer service ratings and positive client testimonials are other long-term indicators of success. As happy people tend to be nicer to others, happy employees tend to practice excellent customer service. A great event will serve as the catalyst for improving your brand’s reputation from the inside out. Be on the look out for all of these factors, both short and long-term, as proof that your event was a success. And remember to set clear goals and expectations from the get-go. Continue to grow your strength metrics, and work tirelessly to improve the weaker ones, and before long your events will be manifesting positive change and growth within your organization. What could be better ROI than that?